Can someone give me some examples of the video sizes for an hour's recording, and a day's recording? For both HD and non HD videos? I wonder what SD Card size should I buy for this camera. It all depends on what you are watching. Outdoors? Inside? A lot of motion? static image? Anyways, your camera supports up to 128GB. 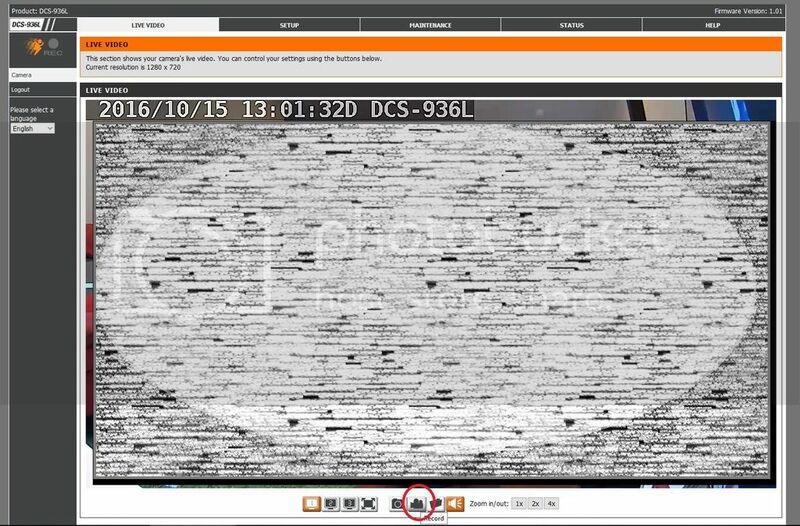 The H264 compression in a DCS-2230 gives my 32GB card about 4-5 days of 24 hour recording looking outside. A previous firmware without H264 encoding on same settings is about 28 hours, depending. If there is a lot of noise in the image - compression won't help. If I were you I would just plunk down the $70 for the 202L as a decent sized SD card will cost you $20. And you wont get the continuous recording ability. I find recording to an SD card based on motion limits the duration of your recording and there is no way to change it. Some events may not be captured on motion but are relevant. IMO you are better off recording 24x7. If you have a spare USB HDD around it would help as you also need one for the 202L. I wasn't aware that the 936L does not have continuous or scheduled recording feature... Those features are so basic and easy to do I assumed the camera would have it. My plan is definitely recording 24x7 as the motion detection doesn't even work well. But spending another $70 and more for a HD box for something the camera should be able to do itself sounds almost unfair. The DNR-202L would not be necessarily needed. Can you please tell me how to set it up? There is 3 kind of recording I wanna do. 1. press record button and it starts recording until I hit stop. 2. set a recording length and hit record. 3. schedule a recording starting from a specific time and end after a certain duration (or by a certain time). I found that to do 1, if I use the firmware page, the file is saved to my computer, but not the SD card. I am wondering why do they not enable it to be controlled by the myDLink lite app. And for 2, the maximum file I can set is 3 mins, which is really short... and make viewing the whole day's video very annoying. Is there a reason for such a short video size? or is there anyway to record something longer like 1-2 hour? Page 39: The only option is to record video to SD Card. Are you seeing something different? If 3 minutes is the max, then that is what it is. Some other cameras I have record up to 50 MB (3-10 minutes based on settings). But those cameras are more full featured than the 936l. 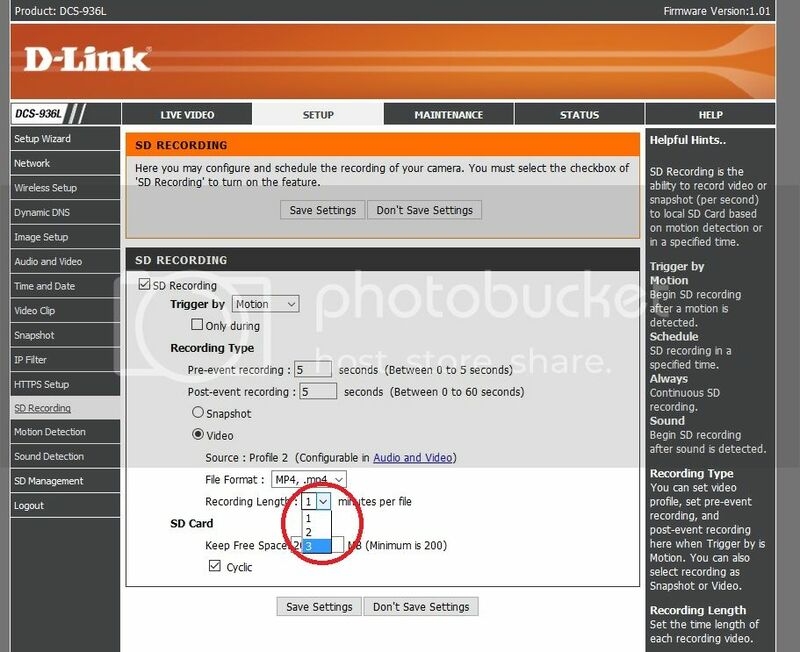 Page 43 is how to access the SD card recordings. Now BaMoh would be correct at your latest request. You would need a DNR-202L to "record continuously".. Although it's not really a continuous recording, but it will display and download like that to you. I'm not sure how you recorded to your local PC. Are you using DViewCam or something? There appears to be no option to write to a shared network drive in the 936l user manual (other dlink camera models have this option). Please start posting images of what you are seeing that is different than the manual. Is there any software I can use to combine the videos in bulk? Thanks for the image. I don't think I've ever used that button. I thought his cam was different as its a newer model but IMO all the 9 series have a max time limit on recordings. So you are gonna have to stick with that if you want to use an SD card. The better option is just to do motion or PIR with the max number of photos sent to you. If you really want continuous and have a spare PC then as RYATT said you can record continiuous for free I believe. Double check the manual - I can't remember. IMO, just get the DNR 202L. Its your most reliable option if you dont want an always on spare PC. On the packaging the recording hours evaluated are based on a 128GB card. Anything lower than this should work. But i clearly found that in detailed spécifications, nothing is detailed. Can it take a 256 or 512GB, don't know.